Martha’s many years of experience working at different schools throughout the Seattle Public School District are brought to Seattle MESA as she works directly to support teachers. She has worked with teachers and parents to help students in reading, math, and writing. 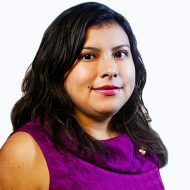 She has also taught Spanish at the University of Washington (UW- Seattle), and recently graduated with a Master’s in Hispanic Studies. She did her undergraduate work in Spanish, English, and Latin American and Caribbean Studies, also at UW. Martha enjoys working for Seattle MESA because, for her, learning never stops. During middle and high school, she was a MESA student in South Seattle. Martha’s projects include In-Class Model, After school, Summer Programs, Teacher Professional Learning, MESA Day, Scholarships, and the Awards Ceremony.